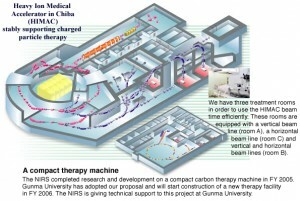 HIMAC in Chiba, Japan, was the first carbon-ion therapy center to take patients, in 1994. The accelerator sends carbon ions into three treatment rooms. Image courtesy of NIRS. Several facilities that will offer cancer patients the latest innovation in hadron therapy, a medical application of particle accelerators, are under construction in Europe and Asia. But so far the high cost of building and operating these facilities has prevented the treatment from becoming widely available. Accelerator physicists from industry and academia challenged one another this week at the International Particle Accelerators Conference in Kyoto, Japan, to find ways to make the treatment, carbon-ion therapy, more affordable. Hadron therapy uses an accelerator to send particles such as protons or ions into a patient’s tumor. The particles travel through the patient’s body and release most of their energy into the tumor cells, damaging them while limiting harm to the surrounding healthy tissue. The development of proton therapy was a huge advancement in the treatment of cancer and is often just as effective as the more expensive carbon-ion therapy, said William Chu of Lawrence Berkeley National Laboratory in a talk on the subject of carbon-ion therapy this week at IPAC ’10. It has been the most widely used form of the treatment. By the end of 2009, about 78,000 patients worldwide had been treated using hadron therapy, according to the Particle Therapy Co-Operative Group, PTCOG. About 86 percent were treated with protons, and less than 10 percent--about 7000 patients--with carbon ions. Both treatments damage the DNA in a tumor cell, which can lead to its death, said Chu, a retired physicist who worked on hadron therapy at Lawrence Berkeley National Laboratory between 1975 and 1993. DNA is made up of two strands of units called nucleotides that form a double helix. Each nucleotide in a strand has a partner nucleotide in the other strand. Proton therapy usually destroys a nucleotide in a single strand, leaving its partner nucleotide intact. The partner nucleotide can tell an enzyme how to replace the nucleotide that was destroyed. This way, the body can repair the damaged cancer cell. Carbon ions, on the other hand, are more likely to damage both strands of DNA. This leaves enzymes without instructions on how to repair the cell and makes it more likely to die. Using carbon ions also can be more effective in tumors with large centers void of the dissolved oxygen that blood vessels deliver, Chu said. Four facilities currently offer carbon-ion therapy: the Heavy-Ion Medical Accelerator in Chiba, Japan; the Hyogo Ion Beam Medical Center in Hyogo, Japan; GSI in Darmstadt, Germany; and the Heidelberg Ion Beam Therapy Center in Heidelberg, Germany. Six new carbon-therapy facilities are under construction in Wiener Neustadt, Austria; Pavia, Italy; Heidelberg, Marburg, and Kiel, Germany; and Maebashi, Japan. However, Chu said, building and operating a facility for carbon-ion therapy costs about twice as much as building and operating one for proton therapy--already an expensive venture at $120 to $180 million. So accelerator physicists will need to develop cheaper ways to offer the treatment if it is to gain the prominence of its more popular relative.